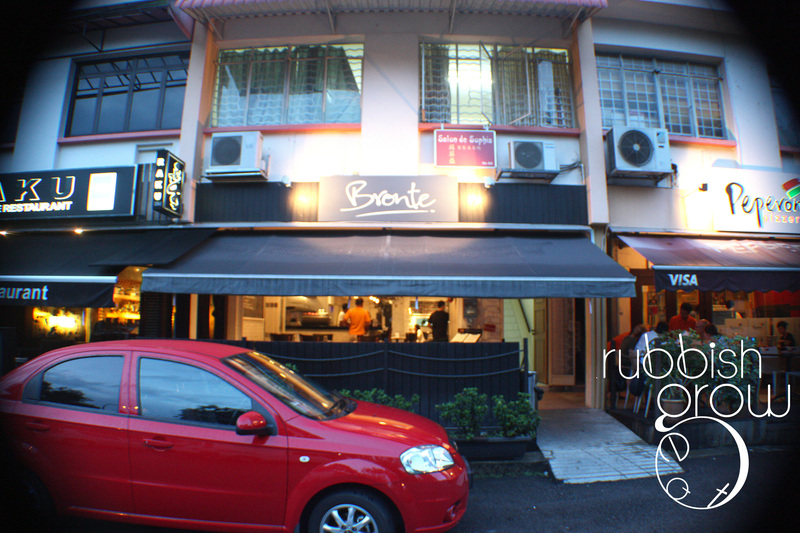 Although Bronte isn’t named after the Bronte sisters, I think the meaning of “Bronte” (lightning) is very apt for this restaurant. It electrified me. 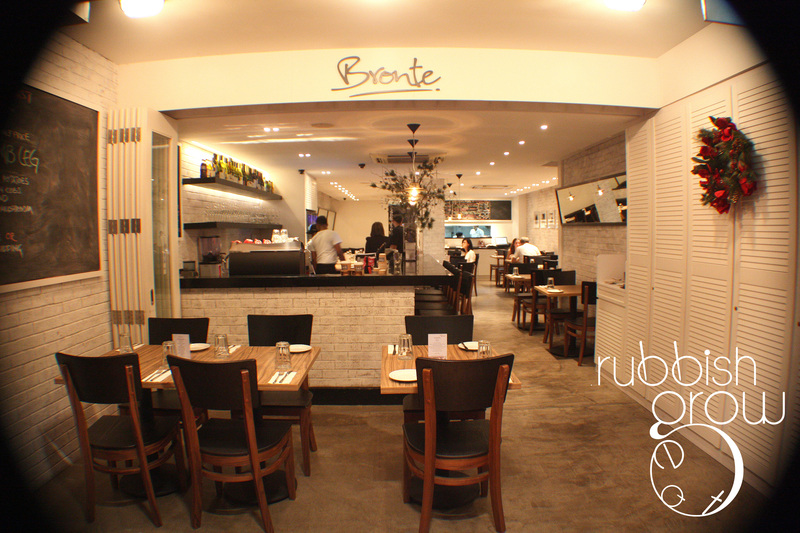 Bronte is named after Bronte beach at Sydney Australia, a place where you get great food at a relaxed environment. This is exactly the philosophy of Bronte: casual dining with fine dining techniques. But casualness doesn’t mean you can’t have taste! The decor exudes much sophistication, using lots of “raw” materials such as cement floor, wooden tables, and whitewashed brick-wall. A small window opens out to the kitchen, so you can see the team at work. Don’t you love the ramp at the entrance, making the restaurant wheelchair friendly? 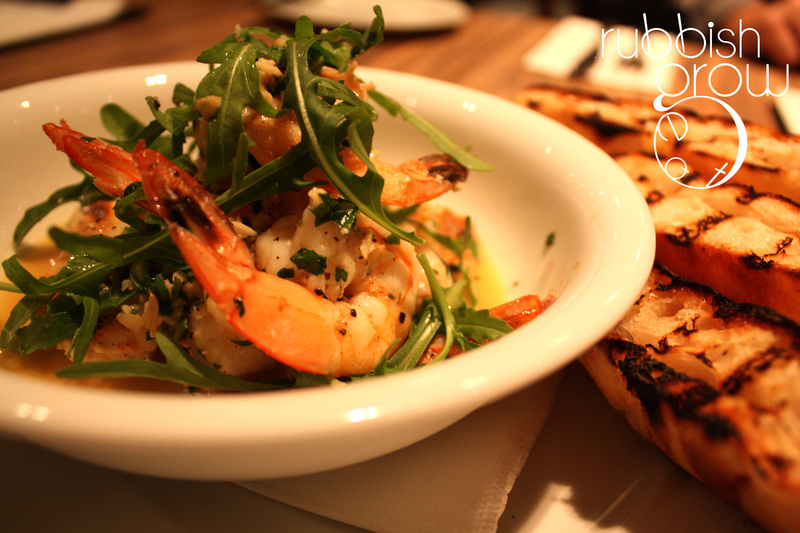 Garlic crystal Bay prawns with rocket and char-grilled Turkish bread ($19). This dish didn’t come with just 3 prawns unlike fancy dining places; it came with at least 8-10 huge prawns. The char-grilled bread was incredibly crispy and delicious with butter melted into it. We dipped it in the buttery-wine sauce to soak up all the goodness. This dish tasted very Chinese, exactly like stirred-fried garlic prawn, but strangely, I didn’t have garlic breath, a dish safe for romantic dates. The bitter rocket, not only complimenting the creamy saltiness, made the dish more angmohized. 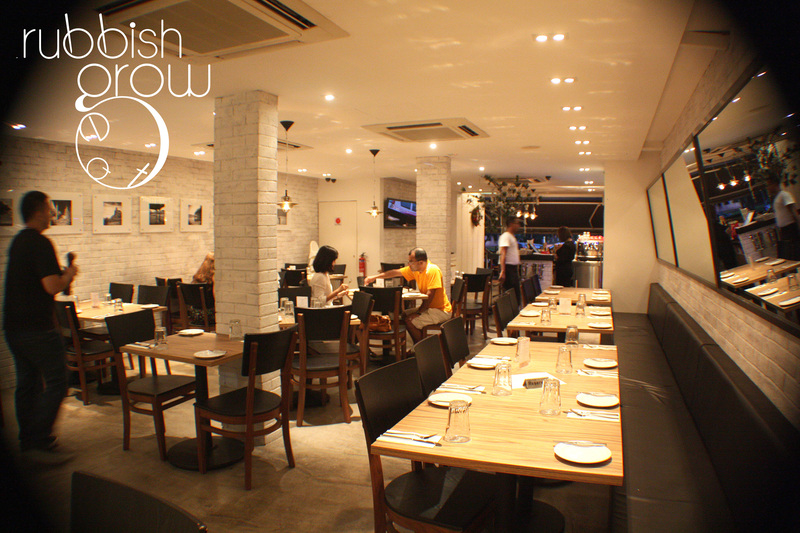 This fusion dish truly reflects Australian culture, with the influence of Asian migration. I love dishes that tell the story of a culture. I never understood the concept of Beef Carpaccio because I thought it was always just beef with rocket–what can go wrong except salmonella?–until now. But Chef Justin Wong–Australian-Chinese who worked at top restaurants in Australia such as Salt and Forty-one (see my review on Salt Singapore)–made the dish his own by adding shredded egg, capers, gherkins (pickle-like cucumber), rocket and blue cheese dressing. Hookerlily didn’t quite enjoy this but I thought it was awesome. It had an exquisite balance of flavors and texture, from the bitterness of the crunchy rocket, pungent scent of blue cheese dressing, vinegary taste of gherkins, and the meatiness of the beef. Everything on this plate worked perfectly. Chef Justin Wong made me “get” and understand the dish. I felt like I was having an education here! Crispy skin shredded duck, potato gratin, spinach with orange infused carrot puree and prune jus. The aesthetics for this dish is insane! Is it extremely gorgeous or super extremely gorgeous?? I want to marry it. 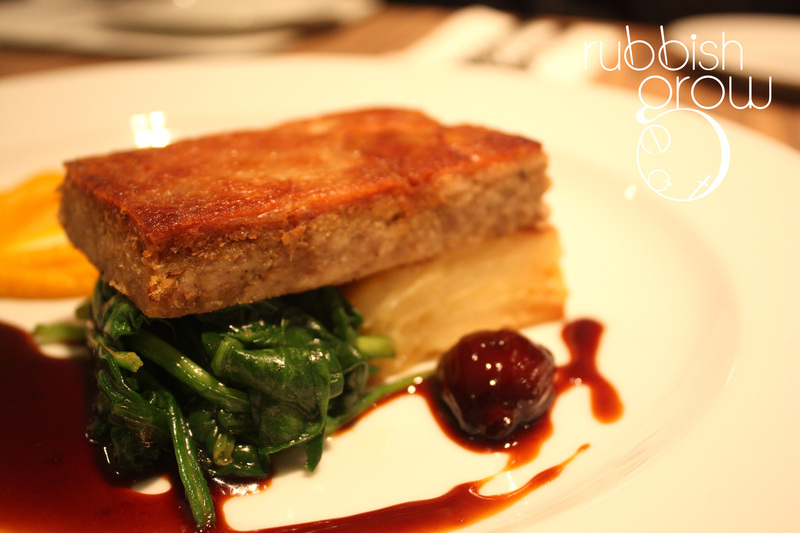 The bright orange puree with maroon prune sauce – stunning. The structure of the duck confit, spinach and gratin – such symmetry. Yes, I said duck confit. What Chef Justin Wong does is to make a duck confit, debone it, shred the flesh, then put it together with the skin, and pan-fry(?) it so that it joins together. So much effort just because he thinks it’s difficult for customers to eat with bone. How considerate! 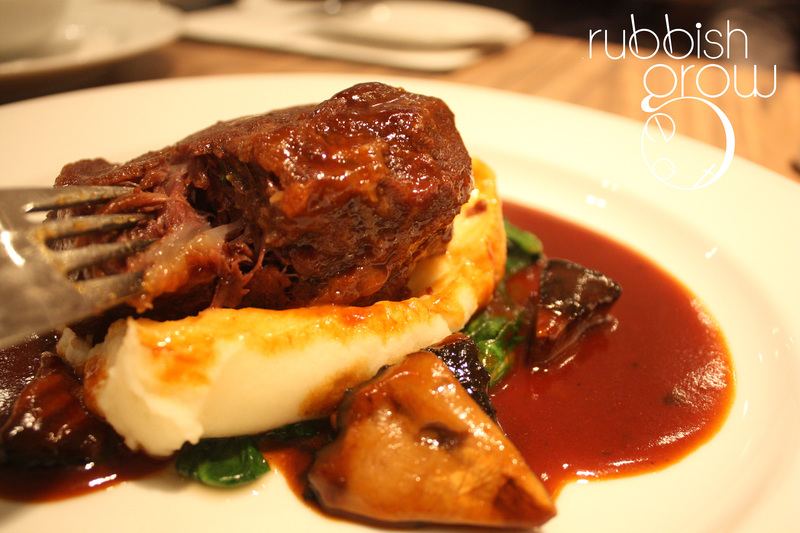 What is truly amazing about this dish was how well the puree and the jus go so well together with the duck. The puree tasted exactly like the Khong Guan lemon biscuit and the prune jus wasn’t tart but had a pleasant mild berry sweetness. Imagine this: smooth, tender shredded duck, with a fat, juicy, crispy skin in Khong Guan lemony-bisuit and prune jus. We call this magic. Good chefs don’t always make good desserts. Having such a wonderful meal so far, I was apprehensive that the curse would be true, that good main courses always mean bad desserts – but the curse is broken! 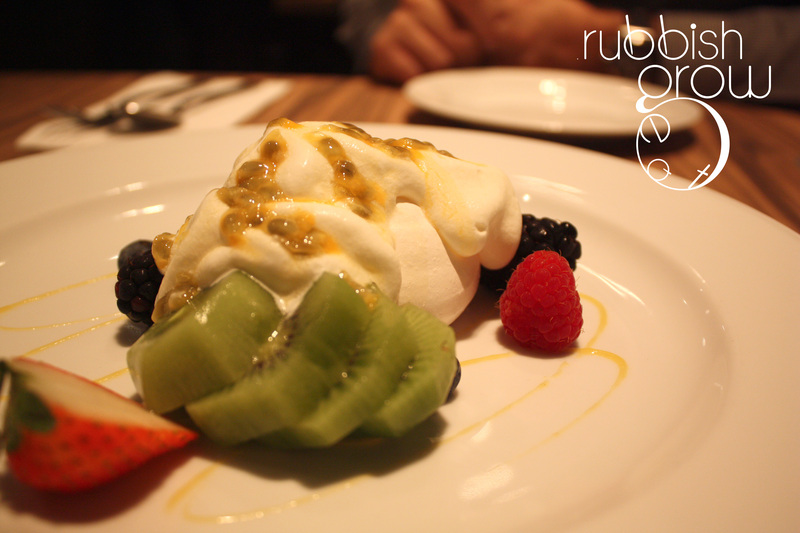 Kiwi and Passionfruit Pavlova ($8) is supposedly a specialty of Australia. It’s a meringue with a thin crisp crust with airy, ethereal cream(?) inside. When I ate it on its own, it tasted like vanilla-sugared air; the thing just evaporated within my mouth. But if you eat it with kiwi or passionfruit, it really takes up the citrusy flavor without competing with it. Pistachio panna cotta with mixed berry compote ($8). I was tasting the pavlova and taking down notes, and I turned to the panna cotta – and Hookerlily nearly finished it already!! The texture was similar to Lao Ban Beancurd Jelly: they are solid outside, but in your mouth, they melt completely. 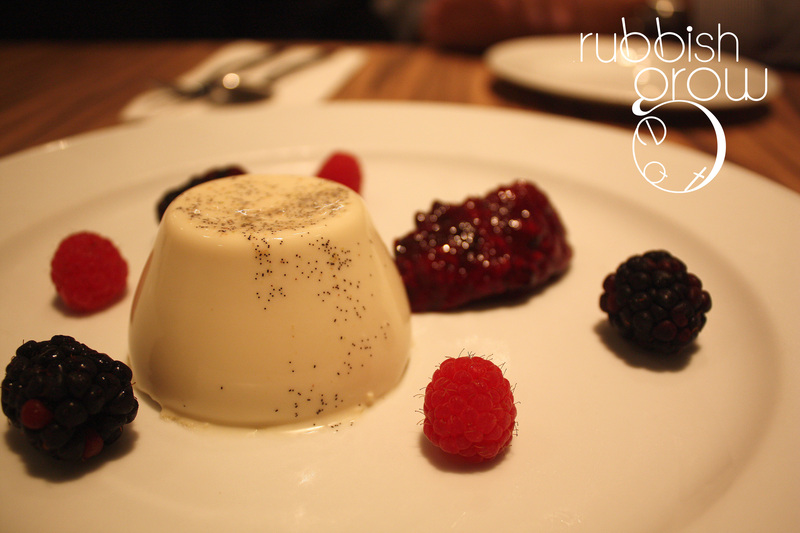 The balance of cream, milk, sugar and vanilla was pitch perfect, the most, most perfect panna cotta ever. It was the right kind of sweetness. I also realized the common thing between pavlova and panna cotta is they are a complimentary substance. If you dip the panna cotta in the berry compote, OMG, there are 712 kinds of awesome-ness in it! The panna cotta absorbs the compote. The compote is, of course, home-made and was super, super delicious. It didn’t have the acidic, sourish nature of berries but it wasn’t extremely sweet either. All things were in balance. Chef Wong should just bottle up the compote, open a factory and sell it as jam. Too bad Chef Wong said he would be replacing the compote with white wine jus. I will miss you berry berry much. The one negative thing about this restaurant is the location. It’s difficult to get to if you don’t take a cab or drive. Luckily, I have my trusty rusty lorry! Such delish food should be in a better location. This is truly an AMAZING restaurant, fast becoming one of my favorites. The food is so delicately balanced and exquisite yet simple and unpretentious; it’s so familiar yet at the same time, original. Sunday Roast (includes a dessert) is only $35 per person; and half price for children under 14.
haha someone is really getting atas..
haha, this one is quite affordable. Slightly above mid-range dining, $40-$60 per person. eh, I eat out everyday… It’s actually quite sad because I like homecooked meals. Coincidentally, I saw a pic of you at a dragonboat race recently. homecooked meals at home lor… my family doesn’t cook.